Once you pre-paid & purchase your VIP package, you will have 30 days from time of purchase to cancel unused massage & receive a full refund, Once your VIP Massage Package are used, they are non-refundable. Customized Signature 90 min. ALL Sports-Cross Fit-Runners Sports Stretch Massage Combo. Hamstring/ groin injuries are the #1 sports injury problem among all ahtletes because of lack of stretching before an event & can take weeks/ months to heal. Inflammation around an inju red hamstring can create extreme pain and reduce your ability to move. When using Cold Compression therapy, you can control inflammation and support the hamstring which speeds up healing and clears away the pain. You don't need medication, drugging your whole body, to mask the pain. You need to reduce the inflammation and avoid reinjury and you will no longer have the pain. Our hamstring rehabilitation programs provide your sports injuries with the tools necessary to relieve the pain of an injured hamstring and dramatically accelerate the healing process. A groin pull is an injury to the muscles of the inner thigh. The groin muscles, called the "adductor muscle" group, consists of six muscles that span the distance from the inner pelvis to the inner part of the femur (thigh bone). 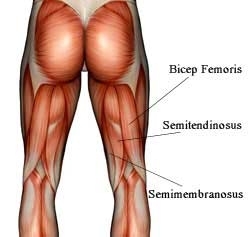 These muscles pull the legs together, and also help with other movements of the hip joint. The adductor muscles are important to many types of athletes including sprinters, swimmers, soccer players, and football players. What are the symptoms of a groin pull? Grade I Groin Strain:Mild discomfort, often no disability. Usually does not limit activity. Grade II Groin Strain:Moderate discomfort, can limit ability to perform activities such as running and jumping. May have moderate swelling and bruising associated.